Voltron is constructed lion by lion. Each lion has its own separate building guide, so should you feel inclined, you can easily share the building process with a friend. 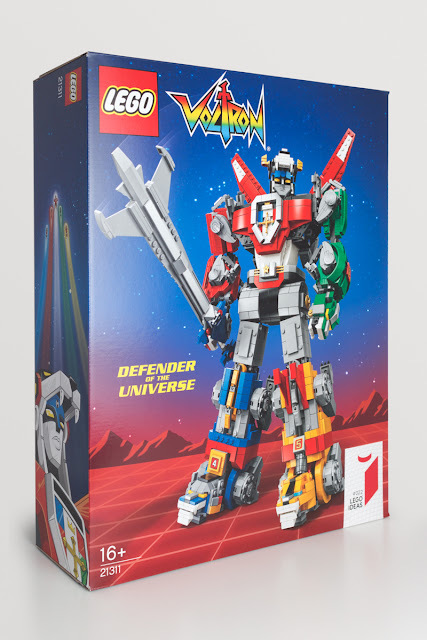 Once all five lions have been built you can combine them to form Voltron. The Blue and Yellow Lions become the legs; the Red and Green Lions form the arms, and the Black Lion becomes the torso and head. The transformation is straightforward. The Blue and Yellow Lion rotate at their necks, each swinging upward and snapping into place to become a foot. The lion’s legs are then folded up, and along with its tail, tucked close to the body. As the core of the model, the Black Lion requires a bit more work. The wings unfurl and rotate upwards and the tail is positioned flat against its back. The back legs are then removed, rotated 90°, and reattached; similarly, the front legs are removed, rotated 180°, and reattached. 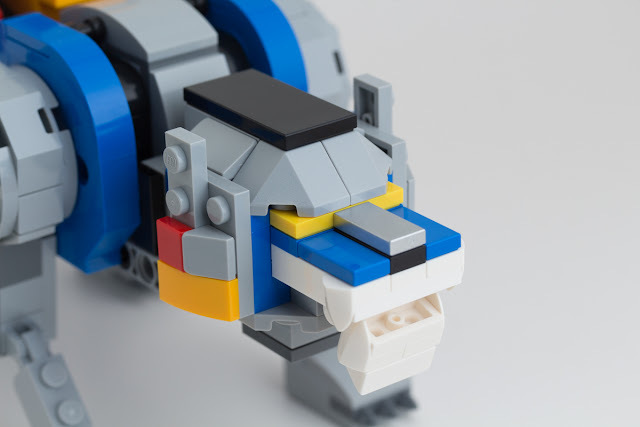 The rear legs can then be inserted into back end of the Blue and Yellow Lions, locking into place with four points of clutch (two clips and two hinges). The Red and Green Lions’ transformation is comparatively simple, only requiring that the legs are folded up and positioned close to the body. 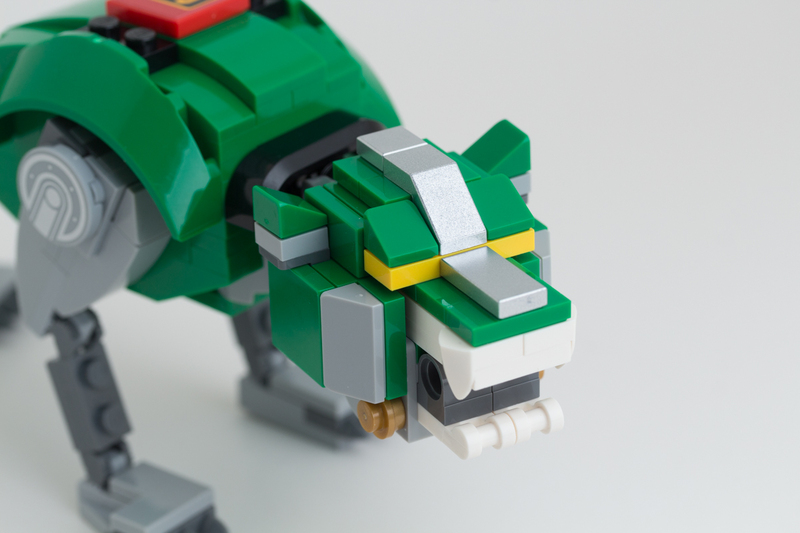 Once done, the lions snap into place on the either side of the torso via Technic pins. 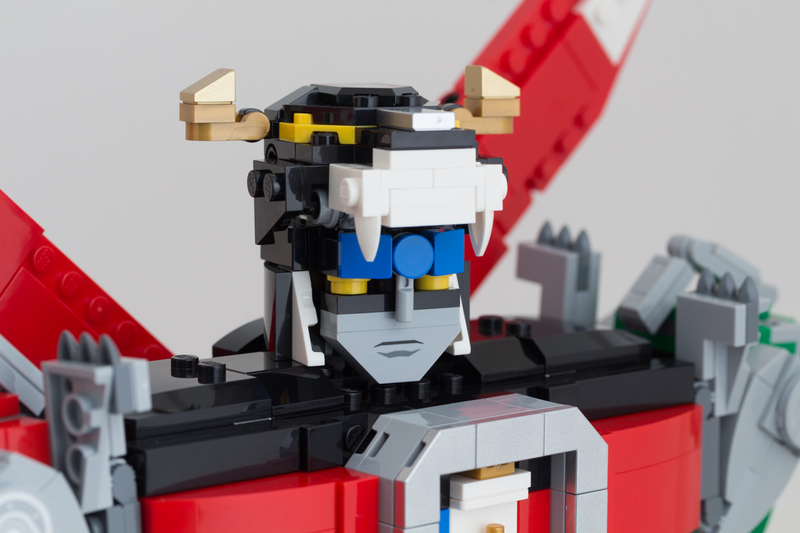 The final step of the transformation is to pull open the Black Lion’s jaw, and via an ingenious two-hinge construction, reveal Voltron’s face. The first thing you notice about the completed model is its height; at 45cm/17.75in, it somehow seems even bigger than the sum of its parts. And that height brings heft. 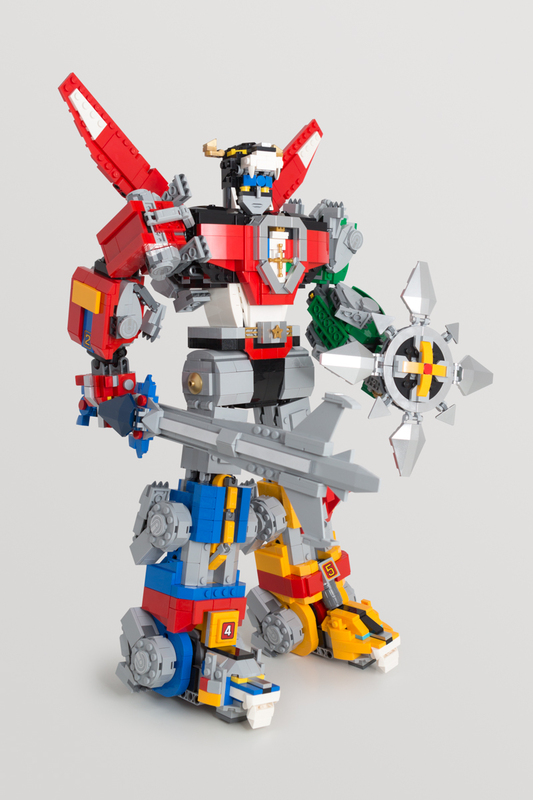 Voltron weighs a whopping 1.6kg/3.53lbs, making it a Modular on stilts. 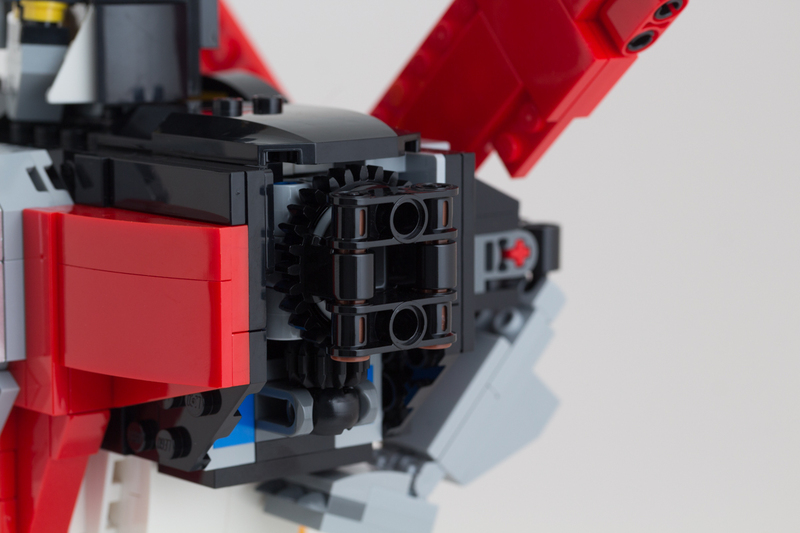 LEGO Designer Niek van Slagmaat was tasked with translating Leandro Tayag’s Ideas project into a shipping product; in our interview with Niek, he talks about the challenges of accommodating the model’s significant weight. The main casualty of this weight is leg articulation; unfortunately, the legs needed to be fixed in position in order to support the model reliably. 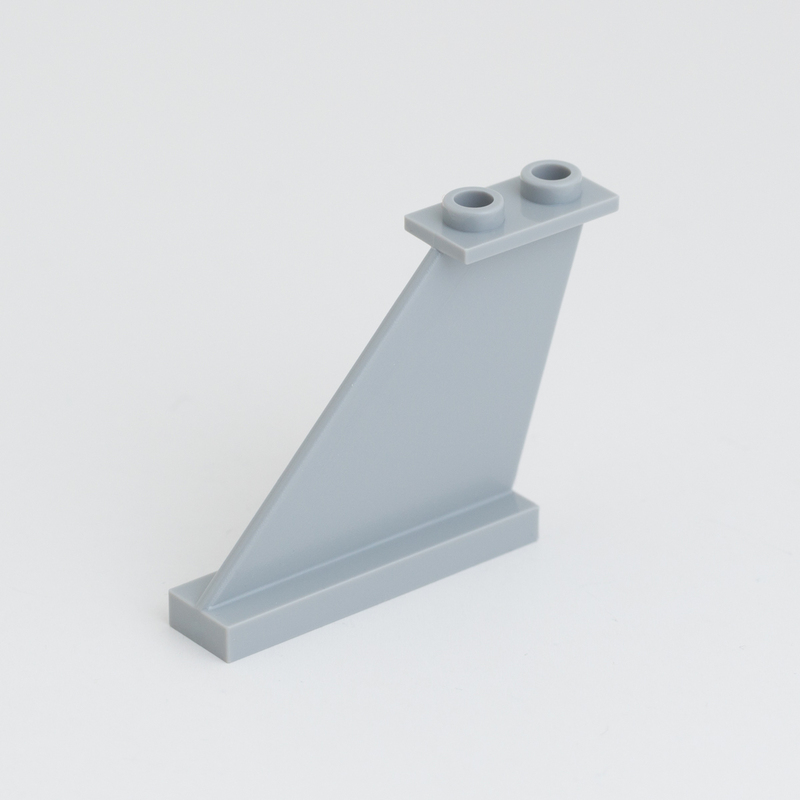 The last thing The LEGO Group (or its customers) want is a model of this weight toppling over with the slightest nudge. 1.6kgs is not inconsequential; in addition to the potential damage done to the model from a fall, it poses a real danger to small children and pets. In its fixed position, the centre of gravity is consistent and weight distribution can be controlled. It’s spread evenly across both legs, balanced at the front and back by the extension of the feet. Happily, the arms have a good measure of articulation. The shoulder joints were specially designed to support the weight of the Red or Green Lion with an attached accessory (i.e., the sword or shield). 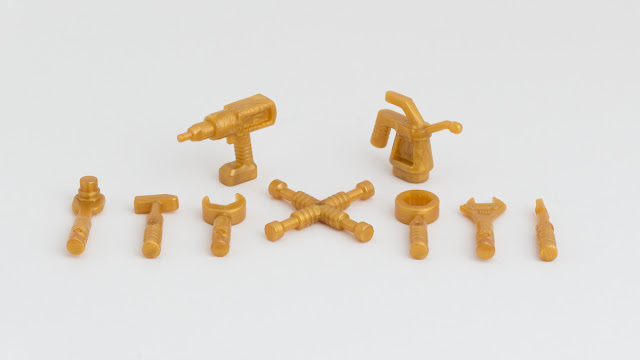 According to the booklet included with the set, over 30 different shoulder joints constructions were tested. The final model features a dual-gear system with tension provided by a ball joint rotating laterally in its socket. It’s a brilliant solution that works very well. 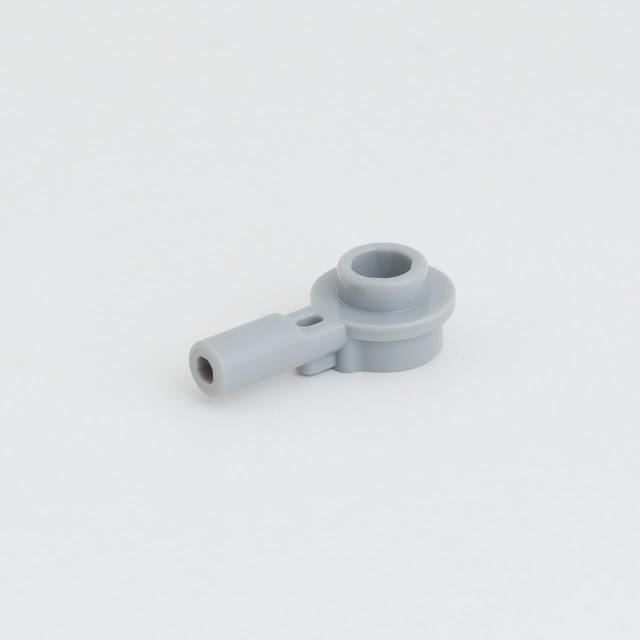 Voltron makes great use of existing parts and includes relatively few recolours (with one key exception – but I’ll get to that later). 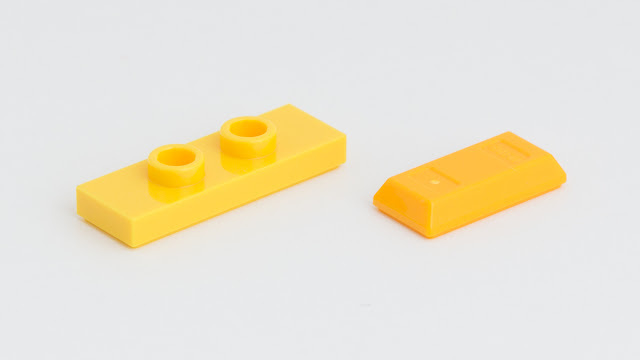 And it should be noted that there are no new part moulds, which is standard for LEGO Ideas sets. 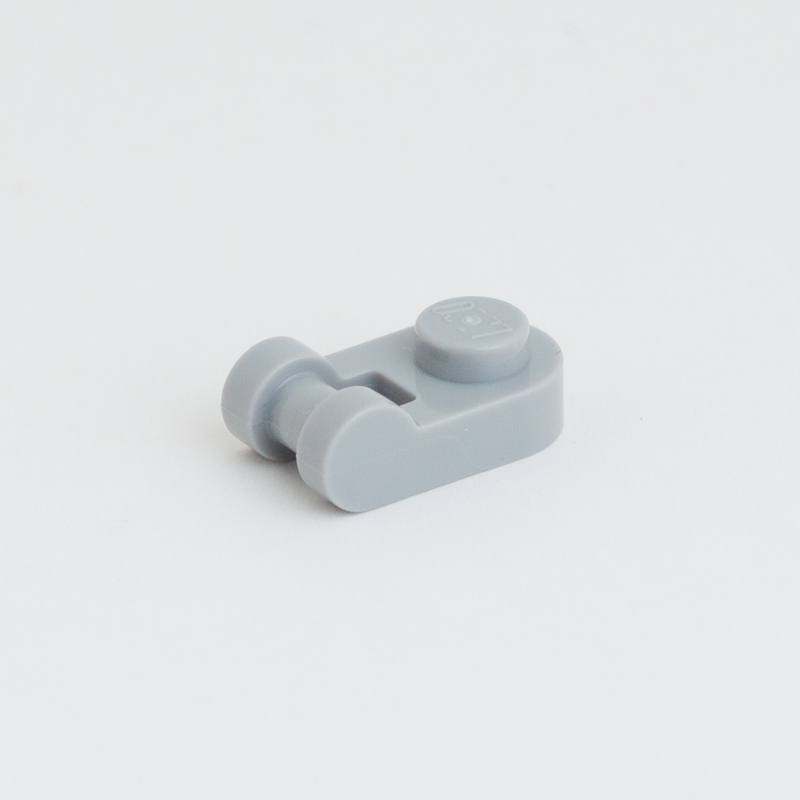 Plate 1x1 Round w/ Horizontal 3.2 Shaft (Element ID 6227897 | Design ID 32828), new in Medium Stone Grey [TLG] / Light Bluish Gray [BL], is effectively utilised to create the nose in Voltron’s brick-built face. 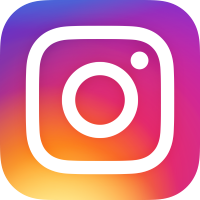 This is just the third colour variant for this part, following its original release in Black and the subsequent Reddish Brown recolour. The similarly named but very different Plate 1x1 Round w/3.2 Shaft (6225246 | 26047), now also in Medium Stone Grey, is used in the shield assembly to position the small silver signs. The part’s rounded back allows it to rotate 45°, placing the silver signs on the perimeter of the shield between the silver windscreens. There are a handful of brighter recolours, too. Voltron includes one 1x3 jumper in Bright Yellow [TLG] / Yellow [BL] (6228602 | 34103), which brightens the eyes in the Blue Lion. Adorning the tail of that same lion are new Flame Yellowish Orange [TLG] / Bright Light Orange [BL] ingots (63236454 | 99563). Also, not pictured, the Yellow Lion is built around two Flame Yellowish-Orange 1x16 Technic bricks (6236763 | 3703). 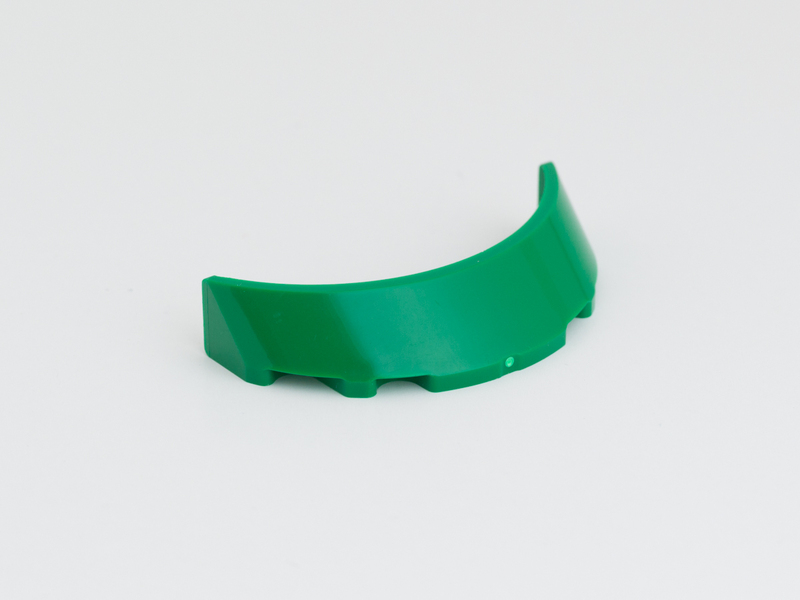 The Green Lion uses two 3x6x1 windscreens as shoulders (6247115 | 35299) in Dark Green [TLG] / Green [BL]. The cross symbol on Voltron’s chest is perfectly represented by a lug wrench in Warm Gold [TLG] / Pearl Gold [BL]. This lug wrench is part of a full Pearl Gold tool set (6236644 | 11402), which will surely prove popular for golden detailing and greebling. The exception I mentioned earlier refers to Voltron’s scores of recolours in Silver Ink [TLG] / Metallic Silver [BL]. 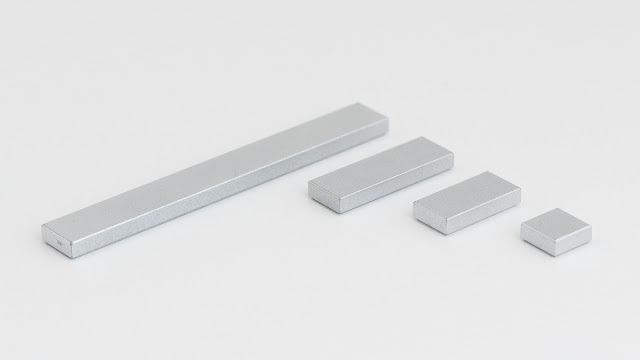 Silver Ink differs from Silver Metallic [TLG] / Flat Silver [BL] in that the brick colour is achieved by coating the plastic part with a metallic finish, a process that lends itself to much shinier bricks than possible with plastic alone. Voltron includes nine parts in Silver Ink, eight of which are entirely new with this set. 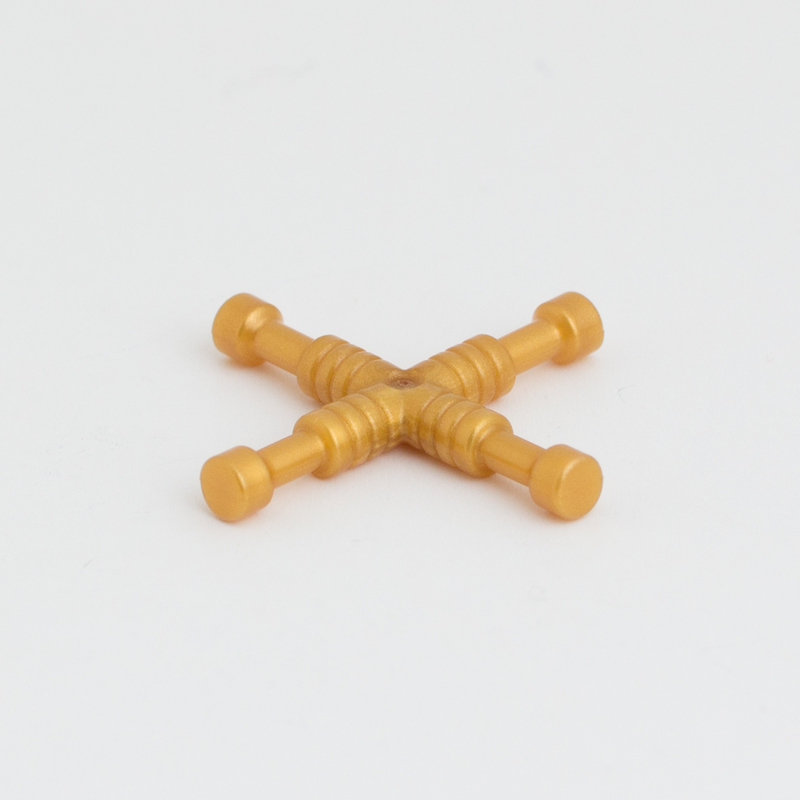 ... as well as 2x2 corner with 45° cut (6237118), and 4x4 macaroni (6237114). Giving the shield its silvery star shape are four triangular signs (6237126) and four 6x4x1 hexagonal windscreens (6237130). 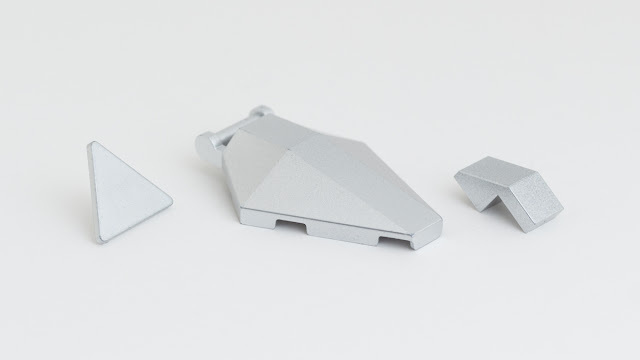 The set also includes silver 1x2 roof tiles/slopes with cutout without studs (6231727), which neatly connect the silver tiles that flow down the heads of the Red and Green Lions. 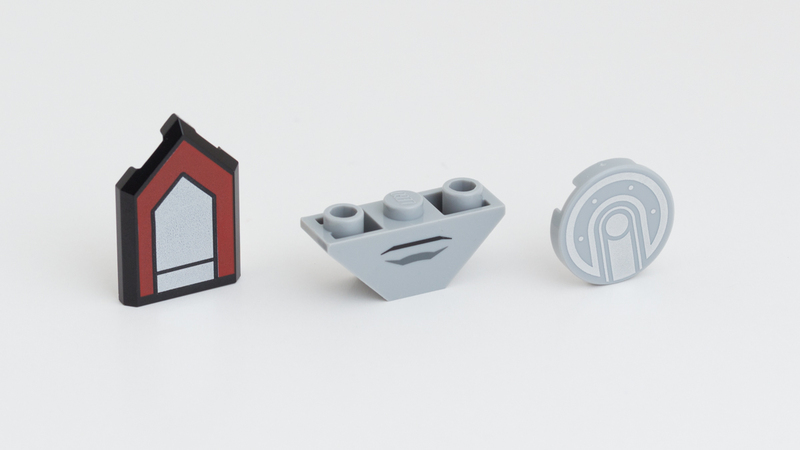 Almost every detail of Voltron is wonderfully brick-built, so printed parts and stickers are used sparingly and their simple designs complement the overall aesthetic. On top of the head there’s a Black shield tile with red and silver decoration (6247143). 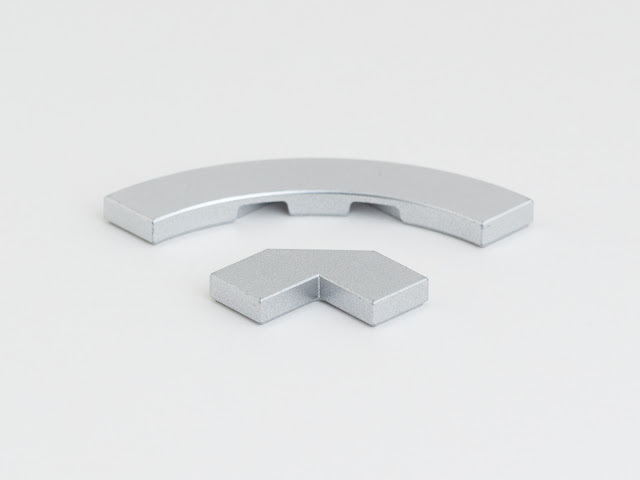 A Medium Stone Grey 1x3 inverted double slope with a mouth print (6237234) forms Voltron’s chin, and each shoulder assembly on the Red, Green, Blue, and Yellow Lions features a Medium Stone Grey Round Tile 2x2 with a mechanical joint print. Stickers are used exclusively for numbering the lions, and match the styling of the original toys. 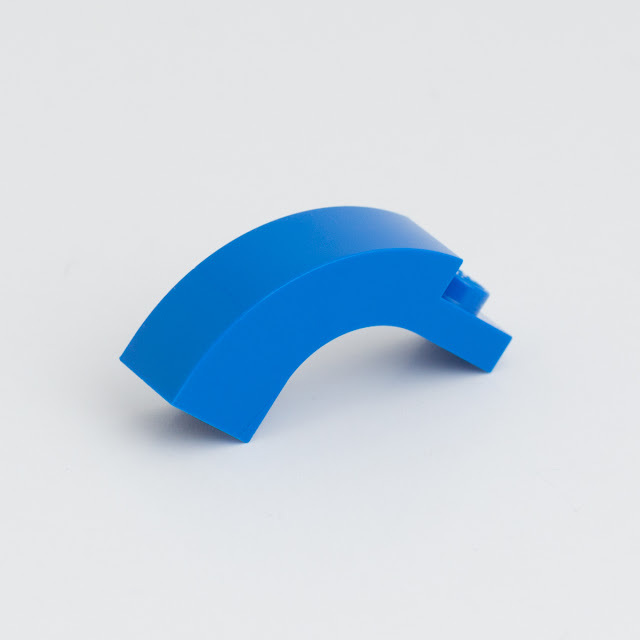 Voltron only includes one notable reissue: Arch Brick 1x3x2 Curved Top returns in Bright Blue [TLG] / Blue [BL] (Element ID 6236764 | Design ID 92903], having last appeared in 2010’s 5993 Offroad Power. 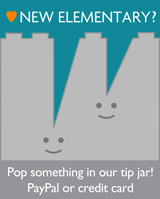 Can't wait for those drum-lacquered elements to show up on Bricks and Pieces. FYI, Plate 1x1 Round w/ Horizontal 3.2 Shaft also exists in gold, so I think this might be the fourth recolor. "Arch Brick 1x3x2 Curved Top, having last appeared in 2010’s 5993 Offroad Power."